The meeting between striking non-teaching staff of universities and the federal government has ended on a positive note. 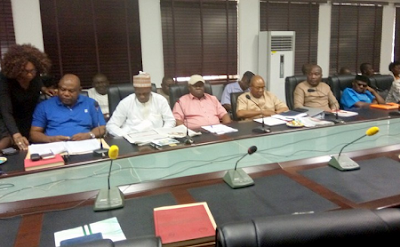 The workers, members of three non-academic unions, SSANU, NASU and NAAT, agreed to consider the federal government’s offer with the possibility of suspending their strike. The agreement comes after a 9 hour, 13 minutes closed-door meeting between the Joint Action Committee, JAC, of the unions‎ and the government delegation in Abuja. The leadership of the unions, however, said the issues raised by the federal government will be taken to the National Executive Council meeting of their unions for deliberation and possible approval. The unions will then get back to the government in six days. Samson Ugwoke, who heads the JAC, told journalists after the meeting that the unions will come back after six days to take a final decision. “Within the said period, government has promised that certain amount will be paid and if the money is paid into the account of the university then it is ours,” he said. Non-payment of arrears of salaries and allowances is one of the major demands of the university staff. On his part, the Minister of Labour and Employment, Chris Ngige, said the unions’ demands have been addressed and the leadership will get back to the government on September 20 after consulting with their members.